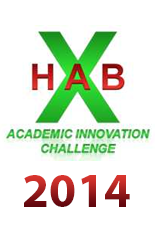 NASA has chosen two teams from the University of Maryland's Department of Aerospace Engineering to participate in the 2014 eXploration-Habitat (X-Hab) Academic Innovation Challenge. A total of seven teams were selected nationally from the pool of proposals submitted to NASA in May. The University of Maryland will be represented by two teams of undergraduate students from Vertical Habitability Layout Studies and Neutral Buoyancy/Parabolic Flight Habitat Studies, as they face five other teams from universities across the nation. Maryland was the only university to have two teams selected for the challenge. The X-Hab Challenge is run by the National Space Grant Foundation for the Habitation Systems Project team at Johnson Space Center and is part of NASA's Advanced Exploration Systems Program. The competition engages university students in Science, Technology, and Math (STEM) disciplines and aims to increase interest in spaceflight-related areas. Students gain hands-on experience as they research, design, develop and produce a subsystem prototype that enables habitation-related functionality for space exploration missions. Participants explore NASA’s existing efforts in the development of space habitats and work to create innovative ideas that complement them. The resulting designs may be applied to a current NASA-built operational habitat prototype. The National Space Grant Foundation funds design costs, development and delivery of the systems. The X-Hab competition is unique in that the student teams are treated as equals with the NASA development teams. While the student teams work from their home school, they are placed in the NASA mission critical path for the product they develop, become the Principal Investigator (PI) for their project, and like other NASA subsystem teams, undergo the same rigorous design review process. The university's teams will be working throughout the 2013-2014 academic year to prepare their products for delivery to NASA in May 2014. For more information about the eXploration-Habitat Academic Innovation Challenge visit the National Space Grant Foundation's website or NASA's website.